A compressed Air-Dryer is a device for removing water vapor from compressed air. 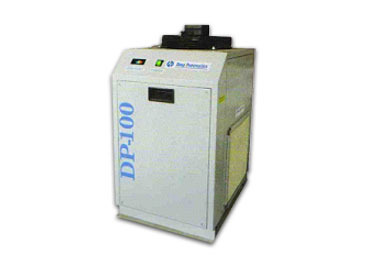 Compressed air dryers are commonly found in a wide range of industrial and commercial facilities. The process of air compression concentrates atmospheric contaminants, including water vapor. This raises the dew point of the compressed air relative to free atmospheric air and leads to condensation within pipes as the compressed air cools downstream of the compressor. Established in the year 2009, we "Confidence Automation Pvt. Ltd.", (CAPL) are engaged in supplying CNC Machines, manufacturing, exporting a wide range of CNC Accessories, Cutting Tools, Computer Aided Design (CAD) and Computer Aided Manufacturing (CAM) Solutions. Under the offered the world's most reputed range, we provide Single Point Solution for CNC Machine Tool Industry. The CAPL sales and service force ensures that you can identify the best technology solution for your needs. We also help ensure correct installation, operation, handling, servicing, training of your operators and providing spare parts and upgrades. We supply a comprehensive range of high precision, high performance, high reliability products from the world's technology leaders to enhance your manufacturing productivity. CAPL supplies the best products in the machine tools industry, enhancing your manufacturing productivity. Our reliable brands augment your advanced machining systems, CNCs and automated processes with further precision and efficiency, delivering optimal up-time. Products include CNC Machines, Stabilizer, Compressor, Cutting Tools, Chucks, Special Chucks, vices, work holding systems, angle heads and VDI tooling. Tool up with the CAPL Single Point Solution which serves a wide range of specialized requirements, applications and specifications. We have group of well experienced and qualified professionals having vast experience of 15 years in machine tools Industry. We understand compatibility with old and new concepts. CAPL is single point source for customer who is part of Machine tools Fraternity. Under the supervision of our Promoter, 'Mr. Milan Goswami', we are able to fulfill the varied requirements of Customers. He is widely appreciated for his excellent leadership & business skills, in-depth industrial knowledge and ethical business policies.